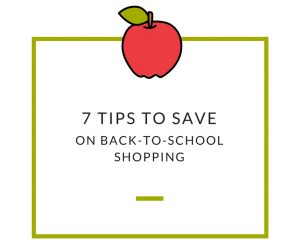 Back-to-school shopping doesn’t have to break the bank! Try these tips and share your own with us on Facebook! Look for the best deal – There are many bloggers who take the guessing out of where you can find the best deal. PassionatePennyPincher.com created a cheat sheet for prices at Target, Walmart, Staples, Office Max, and Office Depot. Prices may vary, but blogs and cheat sheets like this one can help you plan and make the most out of your shopping trip. Stock up now, save later – When you can score back-to-school supplies at a low cost, stock up and use them periodically throughout the year. Some stores are advertising notebooks and folders for less than a quarter and writing utensils, filler paper, and coloring supplies for under a dollar! Once school is in full swing these prices will go back up to their standard amount. If you stock up when everything is on sale, you’ll have your own stock pile to pull from when your kids lose their pens and pencils or run out of room in their notebooks. Set limits – MoneyCrashers.com recommends setting a limit when it comes to “specialty” items. While you can get a plain colored notebook for 50 cents, your child may want one with their favorite singer, sports team, or character that may cost more than their unbranded competitor. Explain money-based topics and set a limit on licensed/special items that will work for your budget. Follow your favorite stores – Many stores use social media to promote sales and share coupon codes. Follow them on Facebook and Twitter and keep an eye out for the best times to shop, especially for back to school clothing. Reduce and reuse – Invest in reusable containers for school lunches. They may require a little extra money up front, but you can limit the amount of times you need to purchase plastic baggies throughout the year. Added bonus, it’s great for the environment! Use gift cards and save – Some stores, like Kroger and Giant Eagle, sometimes offer up to four times the fuel points when you purchase gift cards for places you’re already shopping (Old Navy and Target for example). If you take advantage of the fuel points, this is a great way to quickly rack up points to save at the pump. Grab a few gift cards at the grocery before you go shopping and as an added bonus, remember that fuel points can be earned on these year-round, so this doesn’t just apply to back-to-school shopping! Take inventory – When the following school year comes around check your stock pile to see what you have remaining. You may not have to purchase as much as you anticipated if you have leftover items from the previous school year.